Home Suspended Thierry Henry Suspended Thierry Henry set to lose Monaco job ! 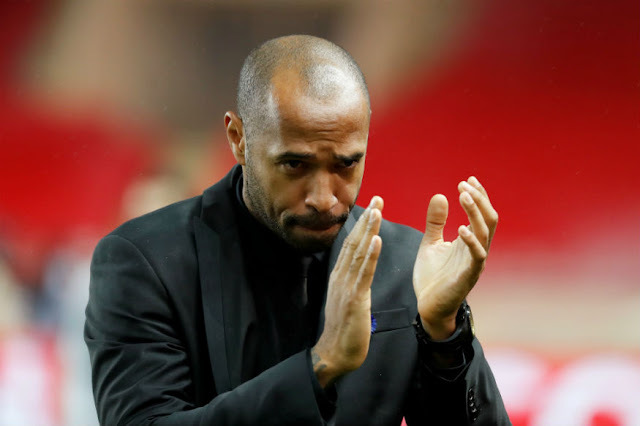 Suspended Thierry Henry set to lose Monaco job ! Thierry Henry was suspended by Monaco on Thursday and looked set to lose his job as coach after only 3 months in charge at the Ligue 1 club, with former manager Leonardo Jardim expected to take control from Friday. Monaco have decided to suspend Thierry Henry … until a final decision (on his future) is made, the principality club said in a statement. Jardim, who was sacked himself last October and replaced by Henry, was expected to be unveiled as the manager on Friday after agreeing terms on a two-and-half-year contract late on Thursday, L’Equipe reported. Portuguese coach Jardim led Monaco to the Ligue 1 title in 2017, the same year they reached the Champions League semi-finals, before being sacked after a poor start to the current season. Monaco, who appointed the former Arsenal and France striker to replace Jardim in October, have picked up only 2 points in their last 5 Ligue 1 encounters and sit 2nd from bottom in the table. The principality side were also knocked out of the French Cup in the last 32 by Ligue 2 side Metz on Tuesday. This followed a 5-1 demolition at home by Racing Strasbourg in their last league outing with the club showing no signs of improvement since signing midfielder Cesc Fabregas from Chelsea earlier this month. During that game, Henry made an abusive remark to a Strasbourg player and later apologised. Passi has previously had caretaker roles at Lille and Olympique de Marseille. Henry, who started out playing for Monaco and went on to enjoy a stellar club career with Arsenal and Barcelona, worked as assistant coach for Belgium for 2 years until 2018 but had never been in charge of a team in his own right. Henry, 41, played for Monaco for 5 seasons, winning a league title with them in 1997. Henry said earlier on Thursday that he would downsize his squad ahead of a crucial game at fellow strugglers Dijon in Ligue 1 on Saturday.